There is not much mentioned about this sign but whatever is available in literatures and case reports where they have described this finding and in view of clinical scenario they have tried to attribute this finding to one particular condition or cause. Most of them have associated this finding with spinal cord infarction, however this finding is not specific or pathognomonic for spinal cord infarction. I have tried to elaborate list of other remote conditions and causes which can present with such finding on MRI or follow up MRI irrespective of clinical settings. Most of them are with reference and few of them are through my personal experience. What is Owl's Eye Sign? An abnormal intra medullary T2 hyper intensity in the region of anterior horn cells of spinal cord, as two white dots, one in each half of cord on axial T2w MRI images in the background of normal gray coloured spinal cord. Winking owl sign is related to vertebral metastases, a reliable sign of osteolytic spinal metastases on AP radiographs corresponds to loss of the normal pedicle contour. The appearance of unilateral pedicle absence has been likened to that of a winking owl with the missing pedicle being the closed eye, the contralateral pedicle being the open eye and the spinous process being the beak. DDs of Owl's Eye in spinal cord. The vascular supply to the spinal cord is primarily composed of one anterior and two posterior spinal arteries, which extend along the length of the spinal cord in a variable manner. The anterior and posterior spinal arteries are connected by a pial plexus that extends around the circumference of the spinal cord. At many levels, the anterior and posterior spinal arteries receive vascular contributions from the radicular arteries, which course along the nerve roots and enter the spinal canal. Thirty-one pairs of radicular arteries exist. 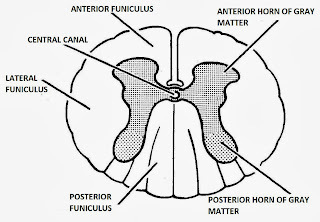 The anterior spinal artery gives rise to central arteries at multiple levels; these arteries supply the anterior horn cells and the anterior aspect of the lateral columns on both sides of the spinal cord. 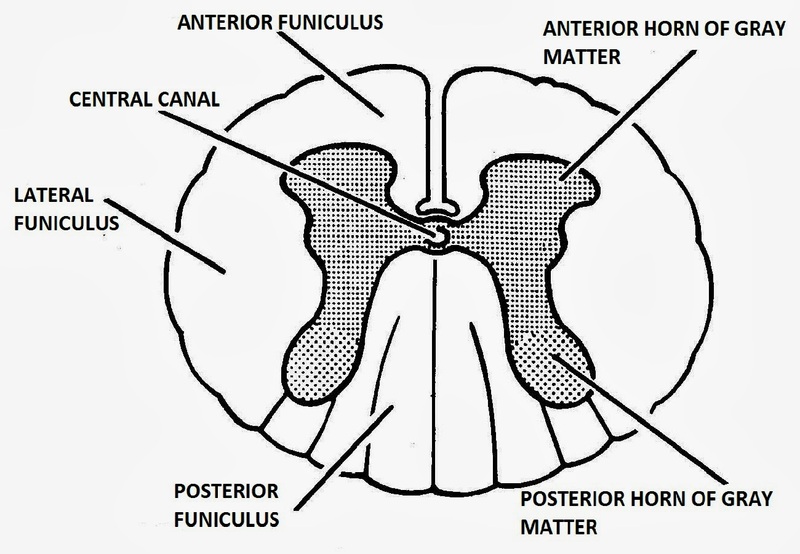 Two major forms of spinal cord infarcts are recognized. The first involves the interruption of supply by the radicular arteries or artery of Adamkiewicz and is characterized by unilateral or bilateral infarcts of the anterior or posterior spinal arteries. The second one is caused by diffuse hypoperfusion and is manifested by central or transverse infarcts. Recognized causes include spinal and aortic surgery, hypotension, vertebral artery dissection, embolism, vasculitis, and cocaine abuse. In about half of cases, infarction occurs immediately after a movement, such as back extension, an arm movement or a Valsalva maneuver, possibly causing mechanical stress on a radicular artery. 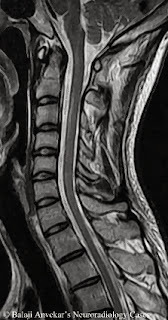 Rapid onset of spinal cord symptoms from retrograde flow of emboli from a herniated nucleus pulposus into the anterior spinal artery or spinal veins during straining, causing an anterior spinal artery syndrome (Wilmshurst et al 1999). There is back or neck pain but often no history of trauma, followed by sudden (minutes to hours) onset of weakness and incontinence. This is more common in women than men and is associated with anterior cord lesions on MRI and anterior horn cell fallout on electrophysiologic testing. Cord swelling on MRI is associated with a collapsed disc at the level of the cord deficit, usually in the cervical region (Tosi et al 1996). The CSF is normal. There is no associated viral syndrome. Recovery is unlikely. A resolved spinal cord contusion on follow up imaging can have similar appearance due to Gliosis. History of trauma particularly hyper flexion injury needs to ruled out clinically. 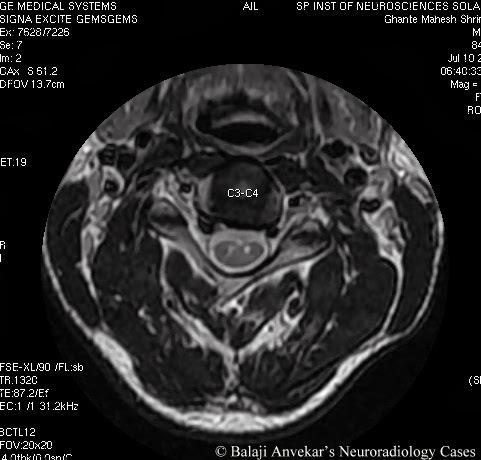 Vertebral collapses may be an associated finding on MRI. A disease of the lower motor neurons that affects the gray matter of the spinal cord, specifically the central horns. In a retrospective study, spinal cord segments from all patients who had had poliomyelitis showed loss or atrophy of motor neurons, severe reactive gliosis, and a perivascular and intraparenchymal inflammation even in the chronic phase, up to 20 years after infection. In acute to subacute phase (up to 8 weeks after acute illness), the ventral horn cells are characterized by a severe inflammation, neuronophagia, active gliosis, and destruction of the anterior horn cells. This correlates with the T2 signal hyperintensity in the region of the ventral horns on MRI and should be fairly specific for poliomyelitis. A bulging disc causing mechanical compression over redicular artery leading to a chronic ischemic changes and Gliosis in the region of anterior horn cell. Disc herniation and degree of canal stenosis may be not be severe as here main culprit is radicular artery compression which is lying anterior to cord and not the direct cord compression by disc. Flaccid paralysis of one or more limbs, 4 to 7 days after an asthma attack. Anterior cord lesions in 2 to 12 year-old children with onset over 1 to 2 days are followed by permanent paralysis. CSF typically contains 20 lymphocytes and 20 polymorphonuclear neutrophils (Hopkins 1974). Possible with an exposure over 50 Gy. Damage is delayed up to 15 years after exposure but is typically 10 to 16 weeks later (Yamada et al 1987). Radiation myelopathy causes vasculopathic and sometimes anterior horn cell changes with high MRI T2 signal owing to Gliosis in corresponding region on follow up studies. Wondering what's with the number '20' in CSF analysis of Hopkin's Syndrome (Asthmatic Amyotrophy)? I never found so much on Owls eye sign of spinal cord. so many DDs at one place. thanks for the efforts. This blog is running parallel to American Journal of Neuroradiology. Only that one patient´s name is viewed. I am still not convinced about how the embolic mucleous pulposus fragments arrive intra-arterially? into the medulla. saw a owl eye sign in a case of polio.